STOP! Don't get out the step ladder yet! Before you decide to display something up high, stop and take a moment to evaluate why, exactly, you want to do so. Too many people think that anytime a shelf is in sight there needs to be something resting on top of it. I'm sorry, but that's just not true. As a general rule, if you have under 2' of space above kitchen cabinetry, very tall armoires or built-ins, don't decorate the space. All too often, doing so dates you to the 1990's and the area does nothing but catch dust. Had we placed objects up there, do you see how they would have distracted the eye from the island and those gutsy light fixtures? In the field of creamy white, the accessories would have stood out and called attention to themselves. That's why I purposely blended the color of the cabinets, walls and ceilings on this job so that you wouldn’t notice the shorter cabinetry. I wouldn’t want to call attention to it by putting things up there, now would I? Too cluttered, too much stuff is placed way up high, it's too busy, and there are way too many different types of things up there. Where is all the money in this kitchen? ...It's in the cabinets, the appliances, the tile. So why distract from the money? Why bring all the attention to the $3 piece of dried organic material up there, when you could be feasting your eyes on gorgeous wood or lovely tile? Items that are simple in style and shape are best up high. I am such a fan of kitchen cabinets to the ceiling and overscaled, tall cabinets that fit the height of these new homes with higher ceilings. It's as if the builders didn’t get the memo that if you’re going to raise the ceiling, the cabinets and other elements need to go too! Seriously though . . . While I’m not in love with the stuff that people arrange way up high just to fill a small void, and I do think people overload those areas where it’s not necessary, there are certain situations and certain times when some decorating actually does need to be done above a cabinet. Really, there are a few approaches you can take when decorating above a cabinet. So, to make sure one of them really works for you, you first have to determine if you have the right space for what you want to put up there and if you have the right accessories to do the job. If you do, you can then begin to address your cabinet decorating as follows. Thank you! Here's your FREE Top 5 Bookshelf Styling Tips Guide! Are your ceilings really high? Is there so much vertical space between them and your cabinets that the area looks blah? 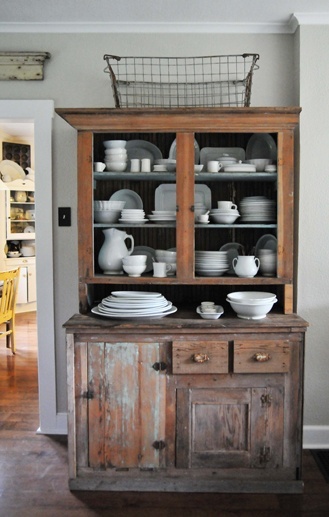 Many times a bookcase, or cabinet, or the kitchen cabinetry feels way too squatty in a room. This is an instance when you need to let your decor items extend the height of the piece of furniture or the cabinets. No matter what, do not put things that are small and detailed up there! You can’t see them very well because they are so far away. Enter your email address for my free Top 5 Bookshelf Styling Tips Guide! If you put any items up there, they need to be big and bulky. Larger, bolder objects should always be used if you’ll be viewing them at a distance. Personally, I prefer large baskets or boxes/containers, large same-type vases or urns that are full and bulbous-looking in a mass, or some other kind of large-scaled simple objects that are similar in type. Remember: What we’re trying to do here is extend the visual height of the piece, so it appears taller. Take a close look at the images below to see how bulky items do a great job creating that illusion. 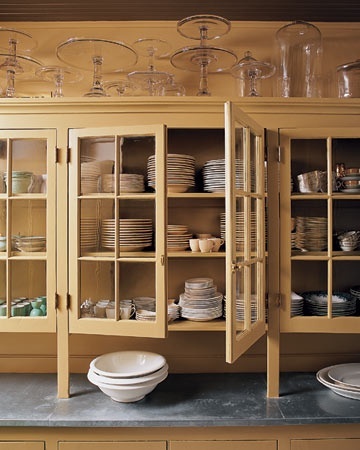 See how the simple, warm-colored shapes of the pieces placed above these cabinets (as well as the repetition of similar items in the first picture) extends the cabinet upwards, making it appear taller? Look how short this piece would seem without those jars above. Do you have something special you want to display, show off? When you have a really amazing collection of something, and you really, really, really want people to see it, displaying what you have above the cabinetry can be appropriate. Remember: Quantity is your friend in this situation. You're creating a visual horizontal band or border, kind of like a cornice or architectural frieze of some kind, which can only be accomplished with lots of repetition of shape and value. For example: I wouldn’t put a collection of vases in a line up high if they were all of different color and value (lightness/darkness), because it would create a spotty type of visual effect and ruin the purpose. Do you see how the candlesticks are all linear and dark? That's is a perfect example of this technique using repetition of shape and value. Don’t line them all up in a row. Group them where they overlap, or slightly stagger them so they look a bit randomly placed. More ginger jars. I just love the mass of blue and white pattern with their bulbous shapes. Does it feel like something's missing? Like maybe an ornament of some sort. Another reason to put something on top of a cabinet is to just top it off, to provide some kind of architectural ornament that's missing from the cabinet. A flourish. You don't have quite so much space but you'd still love to display something up there. Okay, despite what I've said about not feeling like you HAVE to decorate up there, there is a way to put some personality up there without having it look like an over-packed free-for-all. Having decor items on top of a cabinet that blend with the wall can give you the storage and display space you desire, and they won't dominate the scene or make everything seem top-heavy. 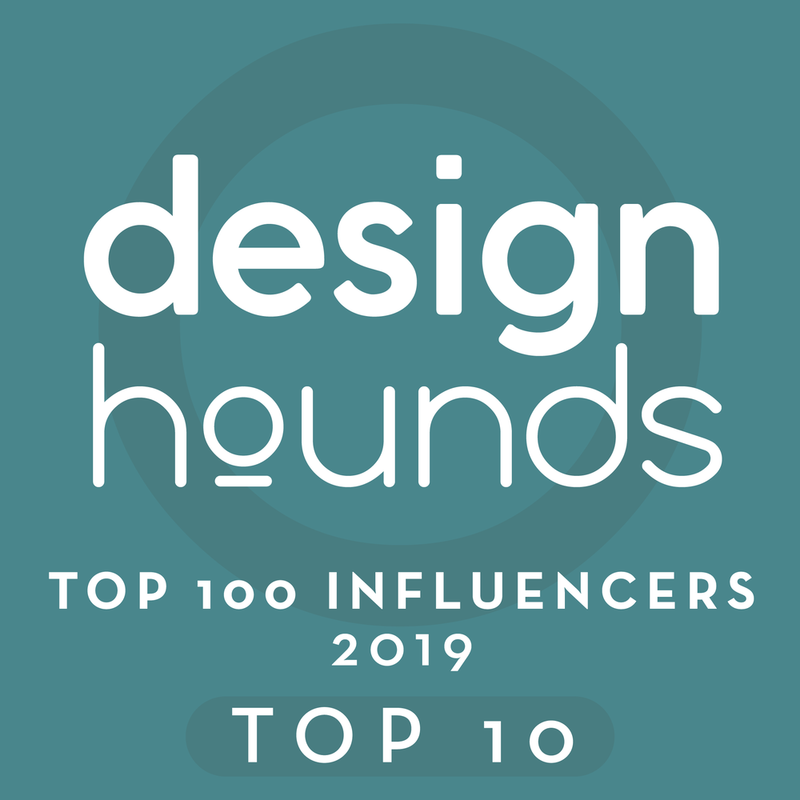 Check out my Design Q and A service, done with a quick click! Same with this image. The boxes colored to blend in with the wall sort of fill in that space without creating a heavy, contrasting, eye-catching visual. Would a piece of hanging artwork work well? Hanging artwork on the wall above a cabinet pretty much does the same thing as all the other suggestions I've mentioned here, however the object is flat and hangs on the wall instead of sitting on top of the cabinet. It's really not that complicated! After you determine the reason you want to decorate above your cabinets, and you evaluate the space you have, the way to do it becomes crystal clear! Are you guilty of placing greenery above the kitchen cabinets?! Come on now. Let's be honest here. I promise I won’t ban you from my blog! Need some ideas for objects that work well up high, above the cabinets? Check out these links below.